The Purpose of Windsor Intermediate Center’s School Wide discipline plan is to create a safe, respectful, and cooperative environment where each individual has the opportunity to be a responsible member of the learning community. This year we are proud to continue School-Wide Positive Behavior Support for the students at Windsor Intermediate Center. 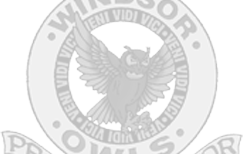 As those of you coming from Windsor Elementary will know, the students love receiving “Hoots.” In our building, students receive “scholarships” when they are showing behavior that follows our expectations, which are being safe, respectful, and responsible. Students bring scholarships to the office and have the opportunity to get their names called for a prize. Be sure to ask your child about any scholarships that he or she may receive and encourage them to show them same behavior at home. Please feel free to view our SW-PBS brochure for more information or contact the office with any questions.